What Macy's can learn from Bonobos. Photo credit: Bonobos blog. The Takeaway: Macy's and other major clothing retailers should consider emulating Bonobos' use of guideshops. Macy's is in trouble. The retail giant, a staple of malls across the country for decades, is struggling to adapt to a changing landscape. In 2015's critical holiday season, the company saw its sales drop 4.7 percent relative to the same period in 2014, and Macy's is in the process of closing several dozen of its stores. There aren't any easy answers for Macy's problems. But it's easy to see that change is needed. One idea: Macy's should consider taking a page from Bonobos. Specifically, Bonobos has experienced tremendous success with its use of guideshops, which so effectively support the concept of distributed commerce. While there are some signs that Macy's may be starting to get onboard with this approach, it's time for the company to commit and take the full plunge. To highlight Bonobos' impressively successful business model, The Hustle recently provided a detailed infographic on just that topic. The source pointed out that Bonobos offers 280 variations of pants, 230 variations of casual shirts and more than 200 variations of dress shirts. Even more importantly, Bonobos now has 20 brick-and-mortar guideshops - a concept Bonobos invented. Here's how the guideshops work, according to The Hustle: Shoppers can start online, browsing hundreds of Bonobos products. If they aren't sure about whether an item of clothing will fit or how it will look, they can head in to one of the guideshops, where a Bonobos expert will take measurements and offer recommendations. The consumers can then either place an order right there and then or wait until they're home. Either way, the product is shipped out immediately thereafter. Bonobos store interior. 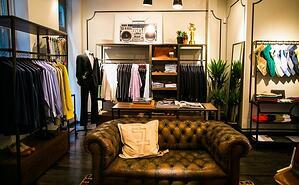 Photo credit: Bonobos blog. This guideshop-based model has a number of key advantages for Bonobos. First and foremost, it supports the idea of distributed commerce. Consumers' shopping behaviors have changed dramatically, and they now want the benefits of convenience without the uncertainty of ordering online with limited information. Combining guideshops with online stores allows Bonobos to give its customers the best of both worlds. 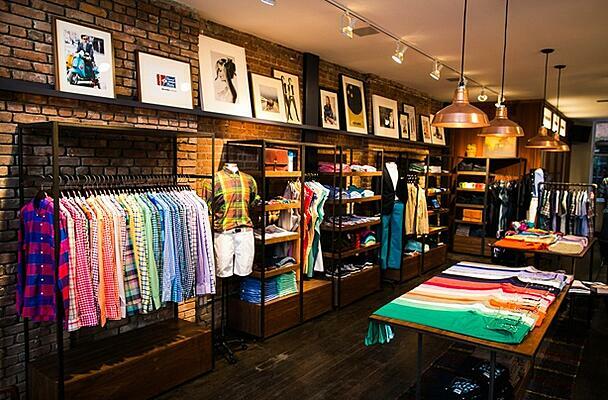 Plus, guideshops allow Bonobos to carry a bigger selection of products in a smaller location. That further improves the customer experience while dramatically reducing operating costs. "Clothing retailers can reach out to their customers and provide great service in more efficient, effective ways." Macy's struggles are largely due to the fact that the company has not been able to adjust its model to take advantage of the new economy. Macy's department stores are massive, and it costs a lot of money to keep those locations fully stocked and fully staffed. As Bonobos has proven, this isn't just expensive - it's unnecessary. Clothing retailers can reach out to their customers and provide great service in more efficient, effective ways by embracing distributed commerce. Guideshops aren't the only option here - retailers should also consider pop-up shops. These are similar, but differ from guideshops in that they are more ephemeral, disappearing after a certain period of time, whereas guideshops are more permanent. This allows pop-up shops to deliver many of the advantages described above, along with a greater degree of diversity and surprise. Macy's has actually already jumped on this bandwagon to a degree, in the form of an Etsy pop-up shop in the flagship Macy's store in New York. As Internet Retailer reported, this Etsy shop will offer eight designers the chance to sell their items from within Macy's. The allows the online retailer to reach out to customers through a new channel, thereby tapping into distributed commerce's advantages. The fact that Macy's has partnered with Etsy on this pop-up shop model suggests that the clothing retailer understands these concepts and sees the value of the experience. To fully thrive in this new era, Macy's needs to adopt more creative solutions to give consumers a more holistic experience.